Happy 38th birthday to Devern Hansack, who threw a five-inning rain-shortened no-hitter for the Boston Red Sox in 2006. 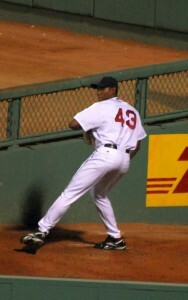 Major League Baseball’s committee for statistical accuracy had already determined that rain-shortened no-nos were not official no-hitters, but Hansack made the most of his October 1, 2006, against the Baltimore Orioles on the final day of the season. He no-hit the O’s for five innings while the Red Sox built a 9-0 lead. Umpires called the game at Fenway Park after the fifth due to rain. You can find the full list of such “close but no cigar” outings on our No-hitters not officially recognized page. Hansack’s no-no was one of his three career starts in the majors, as he appeared in just nine major league games between 2006-2008 while compiling a 2-2 record with a 3.70 ERA.